These civil war style powder horns are polished to a high shine. 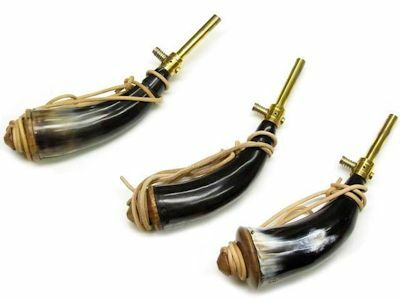 Made from Genuine Horn. Comes with a solid brass dispenser and spring push button valve. The brass dispenser measures out 70 grains powder. (If you would like to change the amount of grains to your specific shooting needs, all it takes is a copper tube cutter to cut the brass tip down). 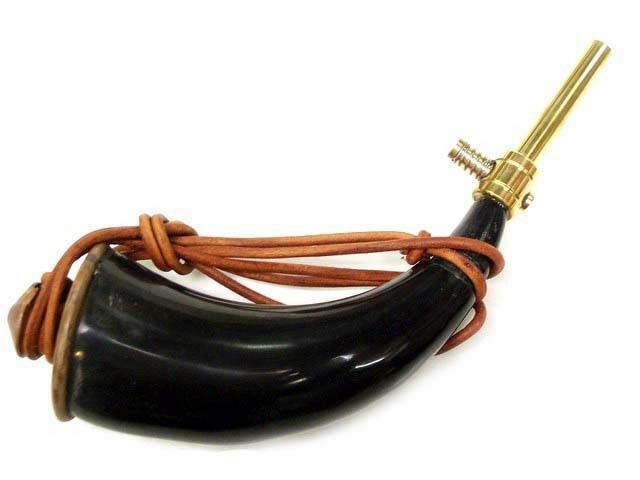 The end of the powder horn is capped with a wooden acorn end piece. The shoulder sling is a 1/4" leather cord. Picture shown is representative. Most of the horns are solid black, but varying degrees of white or cream marbling may occur. Degree of marbling and shapes may vary from the ones shown in the picture. Average length - 10" (including brass spout) x width 2 3/4". Sizes and colors pulled at random. This early American civil war style reproduction would be period correct for civil war reenactments and living history events from the Civil War Era.